As a primary caregiver, it is natural to want to raise a child who is focused on others and who has a sense of responsibility to society. Children, though, do not always naturally possess these traits, especially when living in a culture that caters to an “it’s all about me” ideology. Showing children how to be selfless versus simply telling them how to be selfless may be the key to unlocking the compassion within their hearts. As a nanny, you have the power to show children how to give of themselves through volunteering activities. 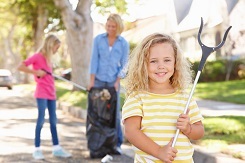 Volunteering can carry significant social benefits for children, says Dr. Mark McKee, psychologist and author of Raising a Successful Child: The Manual. According to McKee, volunteering provides children with the opportunity to discover the world that extends beyond their small and protected environment. “It’s also an opportunity to give to others with no promise or expectation of return or reward and intrinsic rewards gained through the experience will be cherished for life,” he says. Lending a hand to someone in need can heighten your child’s sense of self-esteem and self-worth while also providing an opportunity to possibly discover new career options on which to build aspirations, says McKee. “It’s an opportunity to truly appreciate their own advantages in this life and an opportunity to feel genuinely useful and appreciated, which are things many children never experience living in homes with abundant and at times, unlimited resources,” he says. Although a sulky five-year old or bothered 13-year old may not immediately see the benefits of volunteering, it’s still important to show them through hands-on activities, all while turning a selfless act into a fun adventure. There are unlimited options for volunteering, both locally and nationally, that you can take advantage of to show children how acts of kindness can significantly impact someone else’s life. Find even more opportunities and learn how to brainstorm and plan family volunteer trips with the PBS Family Guide to Volunteering.